For years Family Friendly Gaming has been completely behind video games that give families the biggest bang for their bucks. Compilations of multiple games on one cartridge certainly does that. Cut the Rope Triple Treat is the latest Nintendo 3DS game to do this. Not only was Family Friendly Gaming provided a physical copy of the this game. We were also provided a Cut the Rope key chain. Warning the key chain is a choking hazard. So we will keep that said key chain away from the younger members of the family. No need to have a Cut the Rope accident. 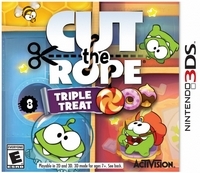 The three games within Cut the Rope Triple Treat are Cut the Rope, Cut the Rope Time Travel, and Cut the Rope Experiments. Each of them were apps that now look fantastic in 3D. Although it can be freaky to see that little green guy eat candy in 3D. The core of Cut the Rope Triple Treat is to cut the rope and get the candy to the mouth of the main creature. Cut the Rope Triple Treat is a physics puzzler that consistently throws new and different things at the players. Families will exercise their brains while playing this hand held video game. What is new for the Nintendo 3DS version? The 3D artwork of course. There are also in-game achievements, online leaderboards, and animated Om Nom stories. I really appreciate Activision bringing this game to the Nintendo 3DS hand held system. I hope to see more games like this on the Nintendo 3DS in the future. Cut the Rope Triple Treat is a classic example of how successful apps can make it over on the regular hand held devices. These games also have been working on the home consoles.